President Danny says, "Thank you, thank you, thank you." With just a little more than 24 hours left in the 2010-2011 administrative year, Optimist International President Danny Rodgers logged on to his optimistarenaman account at YouTube to say thank you to Optimist Club members and Friends of Optimists everywhere. The end of the administrative year provides a time to reflect on all we have accomplished, reboot and prepare ourselves to do even more. Use your final 24 hours wisely friends and do everything you can to make your club Honor. In two short days, Optimist International will celebrate the new year. With only 48 hours left to achieve their annual goals, Optimist District governors and Optimist Club presidents are still seeking new members to join the movement to bring out the best in children. Since Optimist Clubs have different cultures, different approaches are taken in membership recruitment, but two show-and-tell type events crossed my desk recently that I want to share with you. 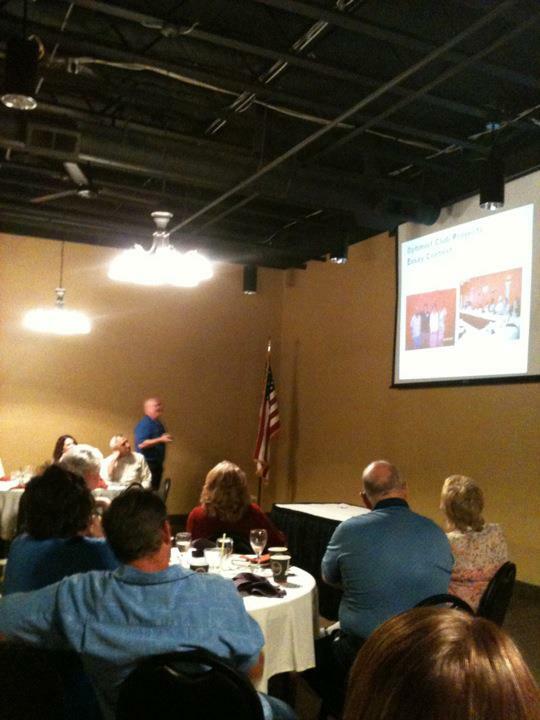 The first was a NOW (New Optimists Welcome) banquet hosted by the Tri Cities Optimist Club in Richland, Washington. (right) The Tri-Cities Optimist Club invited members of their community to enjoy dinner and learn more about the Optimist Club with a PowerPoint presentation. Additionally, current Optimist Club members hosted each of the tables and talked to their guests about the projects their club performs and what they enjoy the most. It's not high pressure, but they do ask for the sale and were rewarded with ten new members that evening. 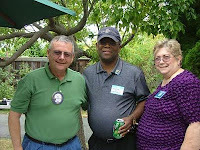 On a little softer side, the Optimist Club of Newark, California hosted what they billed as the "Social Event of the Season" for their Optimist Club and invited members and guests to an afternoon BBQ picnic at the Jett Ranch. (left) Lunch was catered, bocce ball was played, a DJ entertained, and in between the members and guests looked at scrapbooks and talked in glowing terms about the club's projects and youth activities. According to the report, potential new members were impressed, felt comfortable with the club and members and were sent home with applications to complete. They say the applications will come "flowing in." It's always interesting to hear how different clubs promote themselves to others. The key to membership growth is to do projects that people want to participate in, talk about the projects (a lot), and then ask others to get involved. And then remember, sometimes you have to ask more than once because no may just mean tell me more. How do you recruit new members to your Optimist Club? Please share your stories with us in the comment section. Inquiring minds want to know! A hat tree, for when it is really needed. A favorite Optimist Club cause is to help support children who are diagnosed with cancer and their families. On a national level, the Optimist International Foundation collects donations for childhood cancer research at Johns Hopkins University, but at the local level the projects vary, often driven by a need expressed by a child, family or local hospital or support group. Some Optimist Clubs raise money for travel so that a parent can accompany their child to long-term treatment, others give parties or gifts to raise spirits. The ideas and needs are great and Optimist Clubs love to fill in where they can. 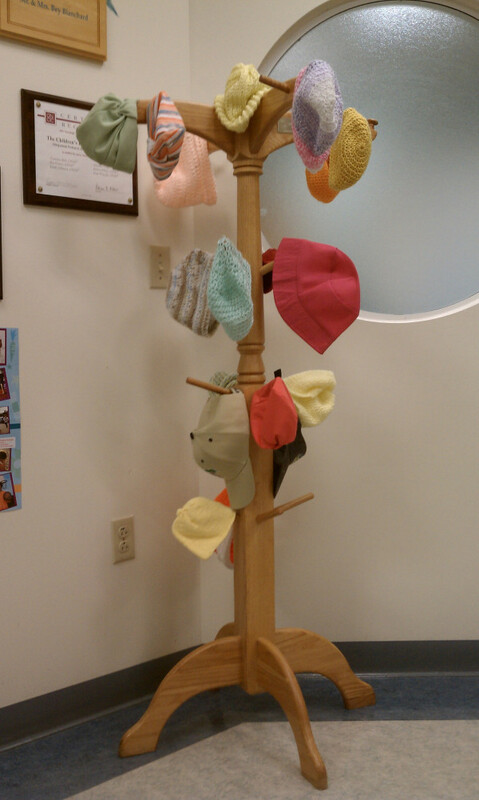 I was quite touched by the simplicity of the project that I came across today on Twitter when Lee Memorial Health System shared this photo: a hat tree. 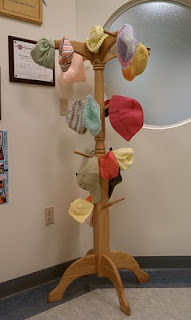 The accompanying update from @Lee_Memorial was "Originally donated by the Optimist Club of San Carlos Park, here's our hat tree for kids undergoing chemo." Giving the hat tree is just the beginning of this practical project. Replenishing it is just as important. What a wonderful idea for a club that wants to get involved with the Optimist International Childhood Campaign right at home. Lee Memorial Health System is in Lee County, Florida. The San Carlos Park Optimist Club has been serving the Lee County community since 1987 by supporting community festivals and sports programs, scholarship programs, oratorical and essay contests and other programs that help children live up to their full potential. Photo credit: Lee Memorial Thanks for sharing the story. How do optimists do it? How do they see the glass half full and find the silver lining in every storm? How can they always look at the sunny side of everything. How do they live a good life? Smile and act happy - it will trigger the real emotion. Exercise - there is a real connection between sound bodies and sound minds. Sleep - happy people allow their bodies time to rest and recover. Enjoy your friends - foster close relationships. Be helpful - doing good makes you feel good. Be grateful - pause and give thanks for what you have. Celebrate - make time to enjoy the wonder of life. Please enjoy this week's choice for Music Sunday: Good Life by OneRepublic. It's optimistic, don't you think? Leadership. Can you explain this great responsibility in one or two sentences? Eight individuals recently honored by the Partnership for Public Service as Service to America 2011 winners were asked to share their thoughts on leadership with the Washington Post. Hear what Alfonso Batres, Diane Braunstein, C. Norman Coleman, James Michael Duncan, William A. Gahl, W. Todd Grams, Charles Heurich and Paul Hsieh had to say by watching the video. Collectively, they agree that leadership has a lot to do with creating an environment that will help people be successful by encouraging them to develop their skills and work together towards he common good. What do you think? Is that leadership in one sentence? Please share your thoughts in the comment section. Go. 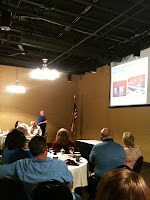 Optimist Clubs are planning for the new administrative year that begins a little over a week from now on October 1. While current leaders complete their promises to leave their clubs stronger than when they began, installation dinners are taking place, and new officers are being welcomed and encouraged to take their new positions with zeal. In the Caribbean District, the clubs hold a handing over ceremony to signify the end of one Optimist year and the beginning of the next. The president's gavel is handed from one president to the next with great honor and duty. Shown here is Immediate Past President Carmen Hackett handing over the gavel to the new President Shellecia Brooks. During the ceremony, President Brooks told her Optimist Club, "Of great importance must be each Optimist member's unwavering commitment to the children of Anguilla." Following the ceremony, club members and their guests enjoyed dinner in preparation for the busy year ahead that will include, among other things, the 9th Annual Race Against AIDS, more community outreach and special support for the Junior Optimist Octagon International Clubs, the youth membership of Optimist International. Thank you to the Optimist Club of Anguilla for sharing the story of your handing over ceremony. Click to read more in The Anguillian. Runners are known to load up on carbohydrates when running a marathon and it looks like maybe these cheerleaders from the Marco Island Optimist Eagles Football league are doing the same. Their first game was last Saturday and along with the players and coaches, earlier in the week, they enjoyed a complimentary kick-off dinner at Nacho Mama's Restaurant. This is one example of how community partners can support youth sports programs with your Optimist Club. Often we look for monetary donations in return for advertising on the fields and the uniforms, but treating the families to a little something special introduces them to area businesses and encourages mutual patronage. Be open to what your business community can offer. Besides, what's better than a free lunch? Parents will tell you a free dinner and no dishes to clean up after is always a winning combination. Find out more about the Marco Island Optimist Club and the football program . 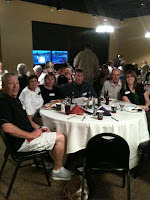 Read the full article about the kick-off dinner at marcoisland.com . Can the Optimist come out to play? Q: Is it the children or the adults that make an Optimist Club special? As you can see in this video from the Optimist Club of Waterloo, Illinois, an Optimist Club is about sharing positive activities with each other. Sometimes it is all about the kids. Other times it is about the adults. But the best times and truest smiles come when they are together, doing projects, learning skills, and playing. Let the big kid in you out once in awhile. Find an Optimist Club and join today. This past week Optimist Club members in the Pacific Northwest District learned they had lost a friend quite unexpectedly. Shock and then sadness was shared between those left behind. The district boundaries stretch from Idaho to Alaska and individuals from each area felt a loss. At times like this, I am reminded of the Lee Ann Womack song, "I Hope You Dance." It always makes me cry, but it's a good cry, a healing cry, as we hope our children and friends always live life to the fullest. Please enjoy this week's choice for Music Sunday and remember even in your greatest sadness, there is hope. 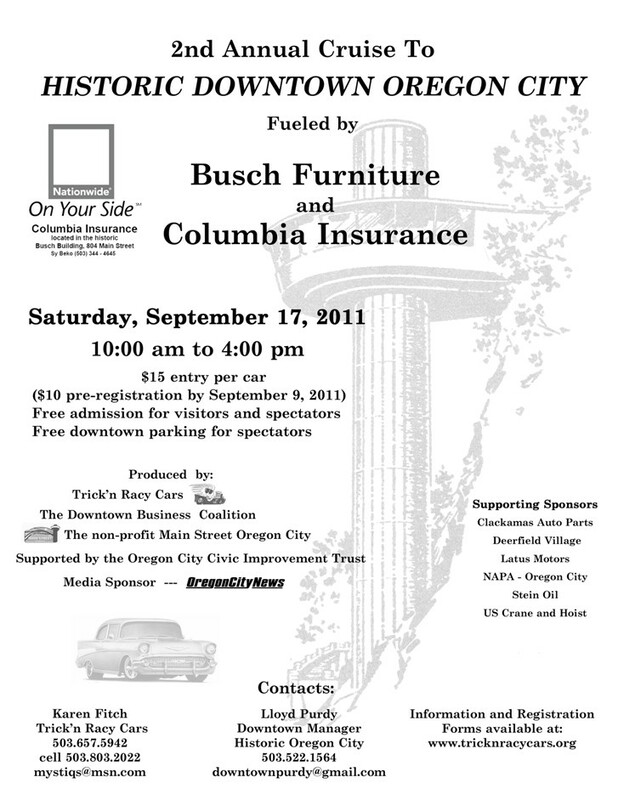 Thanks to Facebook, I know that the Oregon City Optimist Club is participating in a car show today on Main Street, Oregon City, Oregon. 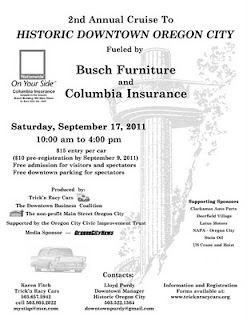 That little bit of information prompted me to learn more, so I clicked on a link that took me to the flyer advertising the 2nd Annual Cruise to Historic Downtown Oregon City (right). Okay, there are cars, sponsors, free parking and admission for spectators, and my goodness, what is that thing in the middle of the page? Is it a restaurant? Since I have never been to Oregon City, I had to find out! According to the Oregon City Public Works Department, that structure is a municipal elevator. Oregon City is one of four cities in the world that has such an elevator. "Elevator Street" connects the lower city to the upper bluff and is the only vertical street in North America. It was built in 1954 and carries over 120,000 riders each year. At the top, the elevator lets out onto historic Main Street, location of the Annual Downtown Car Show. And now, thanks to an Optimist Club activity, you know a little bit of Oregon City and elevator trivia. Click here to read more. 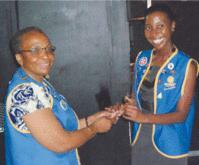 Optimist Clubs are well known for supporting the spirit of community. Participating in car shows and highlighting the uniqueness of our cities and culture are part of the fun of belonging. 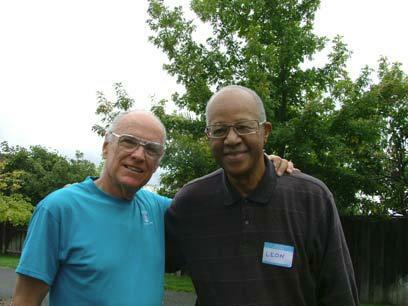 Why not join an Optimist Club as a way to give to your community and to yourself today? Click here to find out how to be an Optimist. Optimist Club members recite the powerful Optimist Creed at every gathering. 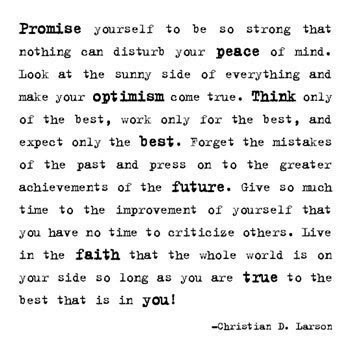 Its positive message brings hope and encouragement to your day and the strength to move forward in the most trying of times. It even reminds you to smile. A lot. Today, I'm happy to share an @Twitter story - that's a story that drew my attention from a tweet. The tweet came from Town Councillor @MaddieDiMuccio of Newmarket, Ontario, Canada. She said, "The Optimist Club of #Newmarket's mandate is to 'bring out the best in kids' and they need volunteers." Her tweet included a link to the Newmarket Optimist Club's website where I found a list of 23 individuals who bring chess, fishing and golf, among other things to the children in Newmarket. They share their positive vision through the Optimist Creed and they engage with the community in person and with links from their website to the town of Newmarket, including hotels, motels, restaurants, city services, libraries and schools. From a link on their website, I could see that they actively support the Boy Scouts, Girl Guides, Air/Sea Cadets and Navy League and the Southlake Regional Health Centre. But what I liked most was this link: Character Matters. 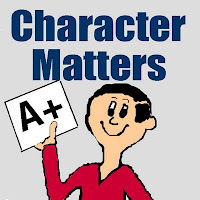 The Newmarket Optimist Club works with the schools in their community to instill good character traits in their students. They believe, "With a solid foundation of moral principles, children will mature and go on to achieve their goals yet still be capable of helping others achieve theirs. The net effect is a world that's a happier, better place to live." Most important, find out how you can get involved in making a difference in the lives of the children in your community by becoming an Optimist Club member and volunteer today. The Newmarket Optimist Club meets semi-monthly, first and third Tuesday, 7:00 p.m. at the Optimist Hall, 56 Forhan Drive. Mountain Home, Idaho is home to the Mountain Home Air Force Base and the 366th Fighter Wing. Approximately 3,500 people live on the base, the major employer in the small town approximately 50 miles east of Boise, Idaho. Mountain Home Air Force Base, an Air Combat Command installation, opened in 1943 as a bomber training base, and has served as an operational SAC bomber and missile base and TAC and fighters before becoming an ACC in 1993. Since 1961, the community has honored the installation with Air Force Appreciation Day. Taking place on the Friday and Saturday after Labor Day, the event includes a fun run and social with refreshments and entertainment on Frinday. One of the largest parades in Idaho takes place on Saturday, with complimentary barbecue and corn on the cob served to more than 5,000 guests. The Optimist Club of Mountain Home gets involved with the festivities every year as the Optimist Cheer Squads take to the streets for the parade and entertainment. Proud mom Kelly Buchanan shared the above picture with me of Optimist Cheerleader Scotlyn. The Mountain Optimist Club Cheerleading program is one of the most active in southwestern Idaho as they cheer for football and basketball, host clinics and camps, and participate in parades and other patriotic activities such as 9/11 memorial services held in the Boise Valley. Optimist Clubs are known to bring out the best in kids and many clubs are involved in sports, keeping kids healthy and teaching good sportsmanship. Another purpose of an Optimist Club is to promote patriotism and an active interest in good government. It sure looks like the Mountain Home Optimists are fulfilling their roles to bring up healthy, good citizens. Keep up the great work! Today, in New York City and beyond, Americans are remembering a day they will never forget by honoring those who were killed, injured or impacted by the terrorist events on September 11, 2001; a tenth year anniversary of shock and sadness. Newspapers from around the US honored the day with front page tributes to 9/11 and stories remembering those they lost or the horror they felt that day. Amid the sadness, one column stood out to me as a better way to move forward. Lynne Steuerle Scholfield lost her mother on 9/11when American Airlines Flight 77 crashed into the Pentagon. She writes that the annual tributes may help some heal their emotional wounds, but for her, it is as if she is asked to attend her mother's funeral again and again. She believes her mother, a clinical psychologist, would prefer we honor the day with compassion and action by looking ahead and taking positive steps to acceptance and renewal, the final steps in the grieving process. Read the essay here: "A new way to remember September 11." I respectfully agree. In order for the nation to heal, we must take the next step and encourage others to do the same. I believe this song by Nickelback, "If Everyone Cared," inspires us to act more, with compassion always. The Optimist International Foundation is the 501(c)3 charitable division of Optimist International. It operates with its own staff and board of directors with the tagline of "Helping Optimists Help Kids." This year, the Optimist International Foundation is celebrating its 40th anniversary. The festivities began by launching a new website, up-to-date and user friendly, with pages for each district, and with what looks like the ability to feature stories about how the Optimist International Foundation serves Optimist Clubs. Of course, the Foundation can only serve Optimist Clubs when they collaborate to serve the Foundation. It is sort of a chicken and egg relationship, but donations are needed to help the Foundation do more. 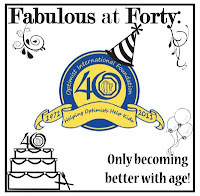 Additionally, the Foundation hopes that Optimist Clubs and Districts will celebrate with a Fabulous at Forty party. Each District has been challenged to raise $4,000 with the parties and while the Foundation says that each host or hostess may decide the theme and ticket price of the party, it seems to me that it might be logical to charge at least $40 per ticket. 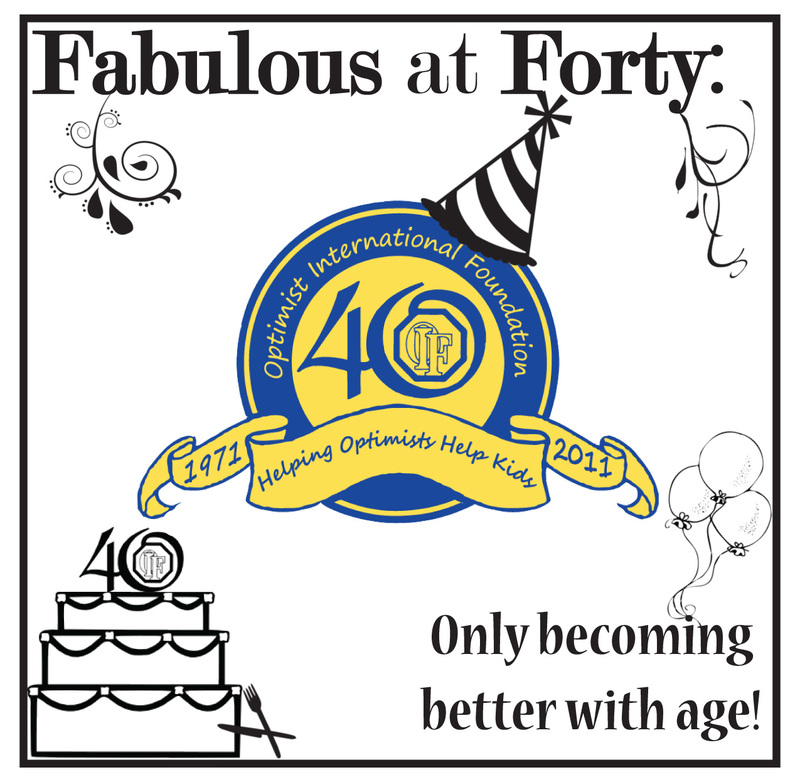 Find out how to host your Optimist International Foundation Fabulous at Forty party here. The Optimist International Foundation serves all Optimist Clubs in the United States, Canada, the Caribbean and other countries. In 1988, the Optimist International Foundation of Canada, now known as the Canadian Children's Optimist Foundation, was established to receive and distribute funds in Canada. In order to share his passion and interest, Brian Voigt, President of the new Optimist Club in Ridgecrest, California recently made what he called a sneaky product placement. When his employer, the Desert Empire Fair, received an anonymous donation of computers, he sent a press release to the paper as an acknowledgement. He included a picture of a computer, ready to go to work, with a a cup of Optimist Club coffee just waiting for its user. Product placement has long been used by advertisers in Hollywood as a way to create brand awareness for their product. Of course, blatant product placement examples create criticism and garner more awareness in the process. Brian called his product placement sneaky. I think it's most likely a snapshot of Brian's workspace and am touched by its authenticity. How do you display your volunteer passion at work? Does your positive product placement inspire others to get involved? Today, for Music Sunday we have two videos. The first is just as cute as advertised: the story of a young boy and his dog. I first saw it on Facebook, posted by a friend because she likes dogs and kids; but when I saw the next video about the cute little boy and his dad adopting a pet from the local animal shelter, I knew I would post both this week on Experience Optimism. Our purpose here is to inspire you to give back to your community in a way that is meaningful to you. Sometimes that is as simple as adopting a pet. Please enjoy. And then reach out; put your heart into a worthy cause today. Optimist International President Danny Rodgers has been out in front of the organization all year. In 27 short days he will turn the leadership and spokesman duties over to a new president, Jack Creswell. It will be interesting to see the difference in the personalities and through the use of social media, we will perhaps be able to see it as never before. About 18 months ago, President Danny found a friend in the Flip video camera and he has recorded messages that describe his travels, express his vision for the organization, and motivate others to reach their goals. The latest message can be seen here and others are available on the OptimistArenaMan YouTube channel. President Danny is also an avid Facebook user and although he rarely does so, he even checked in today on Twitter. Creating relationships is so important for a membership organization. Before the wide acceptance of social media, the only way our international presidents were able to speak to us was from the podium at a convention, conference or organized event. Rubbing elbows with them at dinner or between sessions held sort of a mystical quality. We would also see computer generated letters written, maybe by them, burped out from an assembly line from a central office. I've managed membership associations for a number of years and I know that the general letter of encouragement is needed; however, personal contact makes the letter much more believable because it connects you to the writer's passion. To be able to share that passion will make motivators of us all. Frequent, open and honest communication will lead to more involvement. Involvement leads to membership growth. President Danny has started a different model for communication. It could use more blogging and two-way communication tools, but it's a great start. President-designate Jack, are you listening? How do you plan to open the lines of communication in the coming year? How can we take this opportunity for involvement even further? Note: The Optimist International administrative year begins on October 1. There is something about kids and dogs; they just go together so well. The happy faces, wiggly walk and innocent precociousness to assert themselves into any conversation are unrivaled skills, but nothing is better than seeing one care for the other. And yes, it goes both ways. The child watches out for the dog and the dog will always watch out for the child. Just like Optimist Club members, dogs bring out the best in kids. All of these reasons are why I think this project from the Optimist Club of Marshall, Missouri is the best of show. "The Marshall Mutts Are Us" is a dog show strictly for kids to show the family dog. The dog can be purebred, a rescue, or a mutt; the only requirements are that he is current on shots, kept on a leash, and shown by a youth who is 16-years old or younger. The Marshall Mutts will be judged in 12 categories including most beautiful female, most handsome male, friendliest, best tail wag, best kisser, owner look-alike and best trick. The show is free to all participants and their pets. 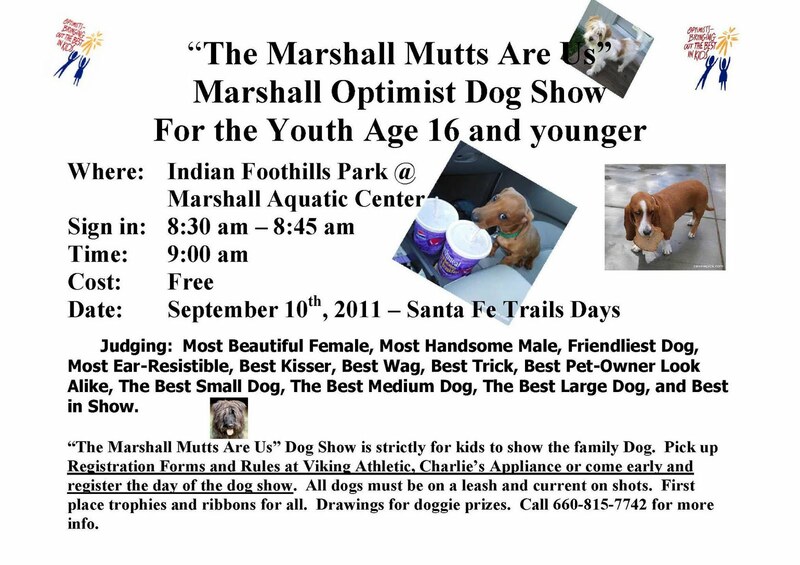 It will take place on Saturday, September 10, 2011, 9:00 a.m. at Indian Foothills Park, Marshall Aquatic Center. Please click on the picture to print the flyer. Thanks to Dennis Desmond for the story.